Erna Finley Obituary - Southampton, Pennsylvania | McGhee Funeral Home, Inc.
Erna Maria Finley (nee Schreiner) of Christ's Home in Warminster, formerly of Huntingdon Valley, passed away peacefully on Thursday, December 22, 2016. She was 91 years old. Erna was the beloved wife of the late John G. Finley, MD with whom they shared 64 years of marriage. Erna was the daughter of the late Joseph and Johanna (Graf) Schreiner. Erna is survived by her children Maureen Small (Rick), Joseph (Susan), Janeen Sacks (Roger), John (Paula), Michael (Pamela) and Colleen Finley; her grandchildren Daniel, Stephen, Theresa, Kimberly, Laura, Amanda and John; and her great-grandchildren Rylee, Payton, Aiden and Gianna. Erna graduated from the Academy of the Sisters of Mercy High School and Saint Joseph School of Nursing earning her RN. 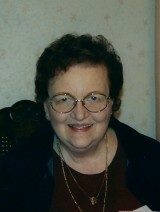 She worked at St. Joseph and Nazareth Hospitals during her nursing career. During this time she met John G. Finley, whom she married in 1951. In 1953 and 1954, they lived in Trieste and Germany, since her husband was in the U.S. Army Medical Corp. After returning home, she decided to focus her time staying home raising her children. During the years, she often used her nursing skills to help family, friends and neighbors. She enjoyed her time with her family, playing the piano, taking trips to the shore and celebrating holidays. Erna's family will receive relatives and friends on Friday, December 30th from 9:00 a.m. to 10:00 a.m. at The James J. McGhee Funeral Home, 690 Belmont Avenue (2nd Street Pike and Belmont Ave.), Southampton, PA. This will be followed by a Mass of Christian Burial at 10:30 a.m. at Our Lady of Good Counsel Church, 611 Knowles Avenue, Southampton, PA. Erna will be laid to rest at St. John Neuman Cemetery, Chalfont, PA. In lieu of flowers, memorial contributions in memory of Erna M. Finley, may be sent to Christ's Home in care of the Benevolence Fund, 800 York Road, Warminster, PA 18974-2006.